Surrogate models expedite the search for promising designs by standing in for expensive design evaluations or simulations. They provide a global model of some metric of a design (such as weight, aerodynamic drag, cost, etc. ), which can then be optimized efficiently. Engineering Design via Surrogate Modelling is a self-contained guide to surrogate models and their use in engineering design. The fundamentals of building, selecting, validating, searching and refining a surrogate are presented in a manner accessible to novices in the field. Figures are used liberally to explain the key concepts and clearly show the differences between the various techniques, as well as to emphasize the intuitive nature of the conceptual and mathematical reasoning behind them. More advanced and recent concepts are each presented in stand-alone chapters, allowing the reader to concentrate on material pertinent to their current design problem, and concepts are clearly demonstrated using simple design problems. This collection of advanced concepts (visualization, constraint handling, coping with noisy data, gradient-enhanced modelling, multi-fidelity analysis and multiple objectives) represents an invaluable reference manual for engineers and researchers active in the area. Engineering Design via Surrogate Modelling is complemented by a suite of Matlab codes, allowing the reader to apply all the techniques presented to their own design problems. By applying statistical modelling to engineering design, this book bridges the wide gap between the engineering and statistics communities. It will appeal to postgraduates and researchers across the academic engineering design community as well as practising design engineers. 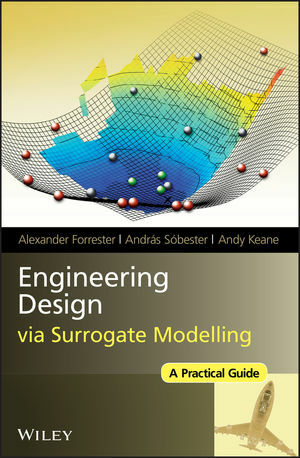 Provides an inclusive and practical guide to using surrogates in engineering design. Presents the fundamentals of building, selecting, validating, searching and refining a surrogate model. Guides the reader through the practical implementation of a surrogate-based design process using a set of case studies from real engineering design challenges. Dr. Alexander I. J. Forrester is Lecturer in Engineering Design at the University of Southampton. His main area of research focuses on improving the efficiency with which expensive analysis (particularly computational fluid dynamics) is used in design. His techniques have been applied to wing aerodynamics, satellite structures, sports equipment design and Formula One. Dr Andras Sobester is a Lecturer and EPSRC/ Royal Academy of Engineering research Fellow in the School of Engineering Sciences at the University of Southampton. His research interests include aircraft design, aerodynamic shape parameterization and optimization, as well as engineering design technology in general. Professor Andy J. Keane currently holds the Chair of Computational Engineering at the University of Southampton. He leads the University's Computational Engineering at the Design Research Group and directs the rolls-Royce University Technology centre for Computational Engineering. His interests lie primarily in the aerospace sciences, with a focus on the design of aerospace systems using computational methods. He has published over two hundred papers and three books in this area, many of which deal with surrogate modelling concepts. 1.1 The ‘Curse of Dimensionality’ and How to Avoid It. 1.2 Physical versus Computational Experiments. 1.3 Designing Preliminary Experiments (Screening). 1.3.1 Estimating the Distribution of Elementary Effects. 1.4 Designing a Sampling Plan. 1.4.2 Latin Squares and Random Latin Hypercubes. 1.5 A Note on Harmonic Responses. 1.6 Some Pointers for Further Reading. 2.1.1 Stage One: Preparing the Data and Choosing a Modelling Approach. 2.1.2 Stage Two: Parameter Estimation and Training. 2.1.3 Stage Three: Model Testing. 2.2.1 Example One: Aerofoil Drag. 2.2.2 Example Two: a Multimodal Testcase. 2.2.3 What About the k-variable Case? 2.3 Radial Basis Function Models. 2.3.2 Radial Basis Function Models of Noisy Data. 2.4.1 Building the Kriging Model. 2.5.1 The Support Vector Predictor. 2.5.3 Finding the Support Vectors. 2.5.5 Choosing C and ε. 2.5.6 Computing ε: v-SVR 71. 3. Exploring and Exploiting a Surrogate. 3.2.3 Balanced Exploitation and Exploration. 3.3 Managing a Surrogate Based Optimization Process. 3.3.1 Which Surrogate for What Use? 3.3.2 How Many Sample Plan and Infill Points? 3.3.4 Search of the Vibration Isolator Geometry Feasibility Using Kriging Goal Seeking. 4.1 Matrices of Contour Plots. 5.1 Satisfaction of Constraints by Construction. 5.3.1 Using a Kriging Model of the Constraint Function. 5.3.2 Using a Kriging Model of the Objective Function. 5.4 Expected Improvement Based Approaches. 5.4.1 Expected Improvement With Simple Penalty Function. 5.5.1 Imputing Data for Infeasible Designs. 5.6 Design of a Helical Compression Spring Using Constrained Expected Improvement. 6. Infill Criteria With Noisy Data. 6.2 Searching the Regression Model. 6.2.2 Re-Interpolation With Conditional Likelihood Approaches. 6.3 A Note on Matrix Ill-Conditioning. 7.1.3 Adjoint Methods and Algorithmic Differentiation. 8.3 Choosing Xc and Xe. 9.3 Design of the Nowacki Cantilever Beam Using Multi-objective, Constrained Expected Improvement. 9.4 Design of a Helical Compression Spring Using Multi-objective, Constrained Expected Improvement. A.5 Multi-objective, Constrained Optimal Design of a Helical Compression Spring. A.6 Novel Passive Vibration Isolator Feasibility.